On Thursday, May 16, 2013, SEF Toronto held their annual end of year banquet at Spirale Banquet Hall. 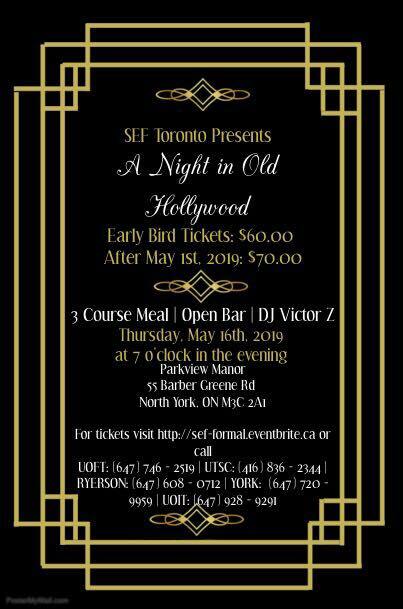 Ryerson, York, and the University of Toronto collaborated to create a spectacular $45 per guest evening, including a 4 course dinner, professional photography, an open bar, prizes, awards, a sweets table and of course, a live DJ who spun both top 40 and traditional Greek. The night was a success as the hall reached its capacity with 101 students and good vibes. All members of the executive teams either baked or bought something for the dessert arrangement. Desserts including fresh apple pie, cherry cheesecake and caramel crunch cake. A raffle was hosted to help raise funds to pay off the costs of the formal. The raffle prizes included were: a Free VIP bottle service inclusive night out (Donated by Era Events), Blackberry Z10 smartphone (Donated by Gravity Wireless), Toronto FC tickets (Donated by the Raios Family), a Jack Astors’ gift card, a Salon Elias gift card, and Java Joe’s gift basket. A special thanks goes to those who contributed to the raffle gifts, and thank you to everyone who purchased tickets in great aspirations. The U of T certificates were awarded after the first meal. 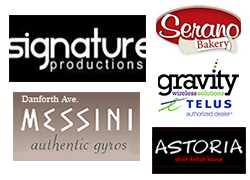 The awards included: Member of the year, won by Niko Katsieris and Anastasios Exacoustos, Directors of the year, Vikki Bekiaris and Danielle Tavernese, and Executives of the year, Nicole Gretes and Dimitri Kyriakakis. The GSA then honoured its graduating class of 2013, which included: Dimitri Kyriakakis, Nicole Gretes, Niko Katsieris, Dion Vassos, and Natalie Sorfazlian. Finally, the recipient of the Azemopoulos award this year is our graduating president, Dimitri Kyriakakis. The Azemopoulos Award is awarded to the most dedicated, hard working President out of the SEF Toronto presidents. A slideshow displaying his many contributions to the GSA over the years was put together by Giorgio Papadakis and this years’ newly elected president, Kosta Katsanevas. 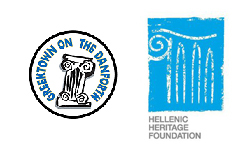 We would like to thank Chris Christofi, owner of Spirales Banquet Hall, for his great generosity and support of the Greek Students Furthermore the U of T GSA would like to thank everyone who came out to another successful event, and acknowledge our members who continue to support our heritage. We look forward to seeing you all in September as we are expecting our best year.